The following diagram gives the present tense and past tense of the irregular verb "to be". Scroll down the page for more examples and solutions. 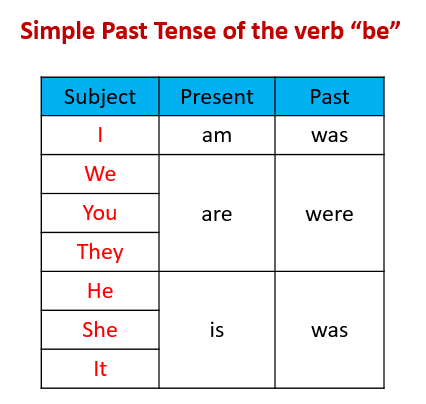 This is an introduction to using "To Be" (was and were) in the past tense. Examples are given in affirmative sentences (no negatives or questions). How to join sentences in the Past with sentences in the Present tense with the conjunction "but"? "But" is used to contrast or show a difference or change in what has already been mentioned. e.g. They were noisy last night, but they are quiet now. This video shows the difference between the verb "be" in the past and the present tense. A teacher shows how to make yes-no questions and answers in the past tense using the verb "be." A teacher shows the differences between "be" and "do" in the past tense when making statements, negatives, and questions.